My first macintosh was a mac plus with a 8 MHz processor and 8-imagewriter dot matrix printer. That was 1986. Then 1990 a macintosh portable already with backlight for about $6,500 followed. 1991 everything was sold and a powerbook 140 was purchased - my first powerbook in my vintage powerbook collection. And now, 28 years of collecting the family of powerbooks is complete. 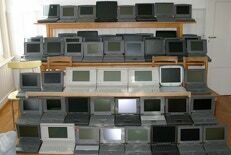 With the powerbook 550c I got all powerbook models apple ever have built. 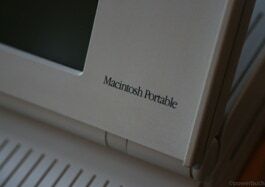 Apple entered the portable computer market in 1989. Essentially a macintosh plus with an LCD screen, the portable was an utter failure due to its clunky design, high price, and poor performance. Apple went back to the drawing board and re-entered the market in 1991 with the powerbook, which set the standard for notebooks in ways that still influence them today. 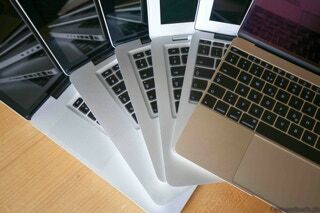 Since its introduction the powerbook has set the standard for notebook design. In 2006 the powerbook name was retired and replaced by the Intel-powered macbook, and with it the powerbook’s influence lives on. Apple has always been known for its design and the powerbook is no exception. It’s biggest contribution to the notebook design was its palm rest with a centered pointing device. Competitors placed the keyboard at the front edge of the case and leaving no convenient location for a pointing device.